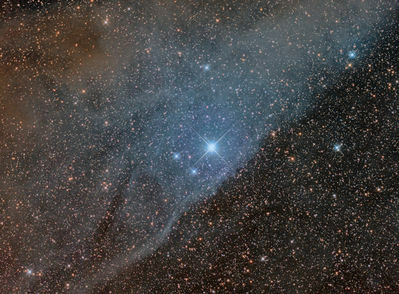 IC 4592 is a blue reflection nebula found in the constellation Scorpius. The image is a total of 4 hrs 10 min exposure (25 x 10 min lights; 30 darks; 55 flats; 64 bias; all at -15 degrees C) taken with an SBIG STF8300 CCD camera and a Takahashi Epsilon 180 f/2.8 astrograph on a Paramount. Image acquisition with Maxim DL 6 on June 1st , 2nd and 5th ; Calibration, registration, integration, and processing with PixInsight 1.8.2.1098.